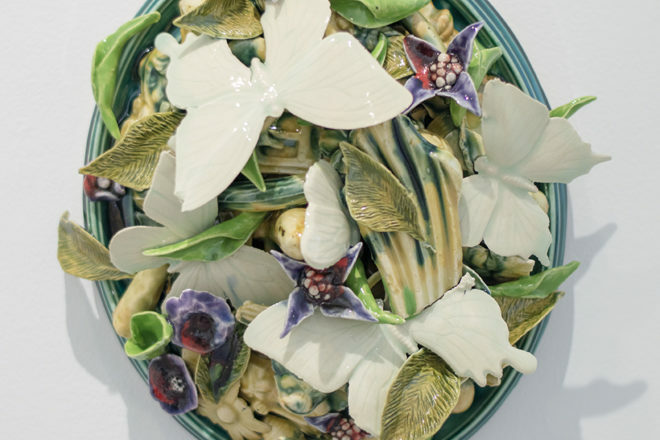 The James May Gallery’s February opening reception – to be held Feb. 1, 5:30-8 pm – will feature paintings by Brighton Smith and ceramic sculptures by Craig Clifford and Debbie Kupinsky. The sculptors will give a talk at 6 pm to discuss their process, inspirations, teaching and collaboration as artistic partners. Smith grew up in Southern California and studied drawing and painting from an early age. He earned his B.A. in studio art and art history from Pepperdine University in 2013. Smith began floral and botanical painting in 2010 with exotic flowers, and since moving to Arizona in 2013, he has learned to appreciate the desert landscape and its flowers. Clifford earned his B.F.A. from California State University – Long Beach in 2000 and his M.F.A. from Louisiana State University in 2003. He exhibits his work nationally and internationally and has been included in the Ceramic Top 40. He is working with Kupinsky on an upcoming, two-person exhibition at the Bloomington [Minnesota] Center for the Arts. He has taught ceramics and art at several universities and now heads the ceramics program at UW-Oshkosh. Kupinsky investigates the role of ordinary objects and images as carriers of meaning and explores the role of layered images in constructing metaphorical landscapes. The relationships between sculptural pieces and found objects are meant to allow viewers to find themselves, their memories and their associations. She seeks to create a visually playful setting in which the layered works take time to reveal themselves to the viewer. The exhibit will run through Feb. 23 at the James May Gallery, 213 Steele St. in Algoma. For more information visit jamesmaygallery.com.